work is too important to be overlooked. Apart from that instinct in human nature manifested in a desire to excel and surpass others in any contest, the habit of playing and singing in the presence of others tends to banish shyness; and that wretched manvaishonte which many of us know to our cost keeps silent many a music lover who, it may be, is no mean performer, but, unused to displaying his or her talent before others than the teacher, is overwhelmed with fright when asked to con�fer pleasure, getting only a partial and individual en�joyment out of a large expenditure of time and money. H. Millard. By per. Wm. 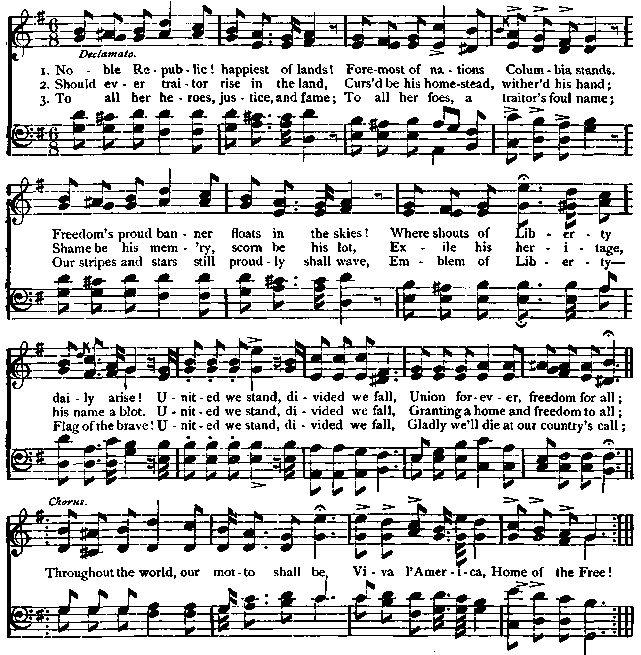 A. Pond & Co.
instruments upon the Union side, until finally a great and mighty tide of harmony swelled up and down out army�" Home, Sweet Home." When they had fin�ished there was no challenge yonder, for every band upon that farther shore had taken up the lovely air, so attuned to all that is holiest and dearest, and one grand chorus of the two great hosts went up to God. When they had finished, from the boys in gray came a challenge, " Three cheers for home ! " and as they went resounding through the skies from both sides of the river," something upon the soldiers' cheeks washed off the stains of powder." � Frances E. Willard.